When restoring historic organs it helps a great deal if the organ is well-designed and well-made, and if the subsequent repairs and restorations are conscientious. The organ at Thaxted is definitely well-made. Our respect for Henry Lincoln’s work increased as we worked on his organ. The individual parts, the metal and wooden pipes, the key and stop mechanism, the wind chests and bellows, are all made with exemplary care and attention. The organ has evidently continued to do the job for which it was intended, and it has always generated affection, not least in Gustav Holst. The endorsement of a famous composer has helped to preserve organs in this country and elsewhere, when they might otherwise have succumbed to the latest fashion. There were one or two lapses in Lincoln’s work, and one or two changes of mind. Pedal organs with their own pipes were quite new in 1821. So was the provision of a second Open Diapason on the Great Organ, and the extension of the key compass down to FF (i.e., F in the 16-foot octave). All these large bass pipes evidently proved a problem to organize and they are crammed together on the bass and treble sides of the organ, with the Swell stop action squeezed hazardously in-between on the bass side. It looks as if there was an original plan to have the pedal pipes playable from the Great Organ wind chest but that was abandoned. Swell Organs were also developing, and the original intention to provide louvred swell shutters had to be abandoned in favour of the traditional sliding shutter because the swell box was too close to the pipe front. More surprisingly the large pipes in the organ were not supported properly. The gilded front pipes could have had hooks and pins to hold them to their supporting pipe stays. In 1858, Holdich added blocks to the side towers to lift the pipes behind the carved pipe shades. The very largest inside pipes have pipe stays, but many do not. The tin-lead alloy of which the pipes are made is fairly stable; it is fine while the pipes are perfectly round and upright, but dangerous once the pipes start to lean or bend. By 2012, many of the largest pipes had started to fall over, and one of the largest gilded front pipes was threatening to fall out. Subsequent organ builders have dealt kindly with the organ. 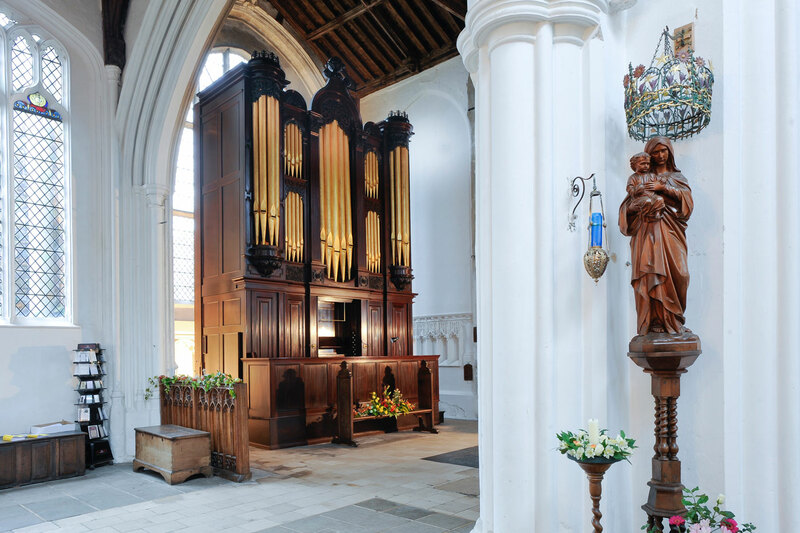 Holdich, who moved the organ to Thaxted, was a careful builder with a reputation for sympathy towards old organs. 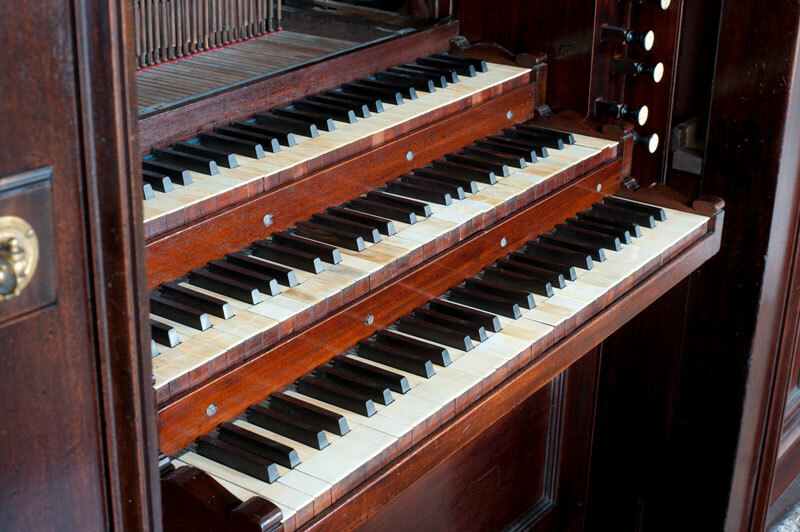 He may have added and certainly modified the pedal couplers (which allow the organist to supplement the single stop on the Pedal from the Great and Choir Organs). It looks as if the Great Organ may have been difficult to play, because the roller-board was replaced with a new one, probably by Kirkland in 1907. After earnest debate in 2013 it was decided not to replace it with a new roller-board (in Lincoln’s manner, copied from the Choir organ), in case the key action once again became too heavy. Sadly the Great mixture and trumpet and the Choir bassoon had disappeared early in the twentieth century, perhaps because the reed pipes had collapsed and the tiny pipes of the mixture had been bent and damaged from tuning. At some point, perhaps even when the organ was moved in 1858, the smaller pipes in the organ were treated carelessly, as if they were jumbled together in a sack. 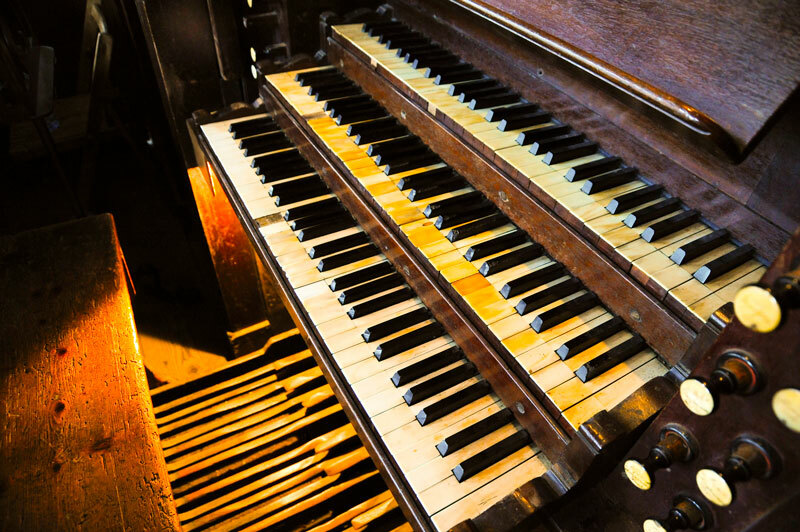 It is unusual for an organ to last for 150 years between restorations. 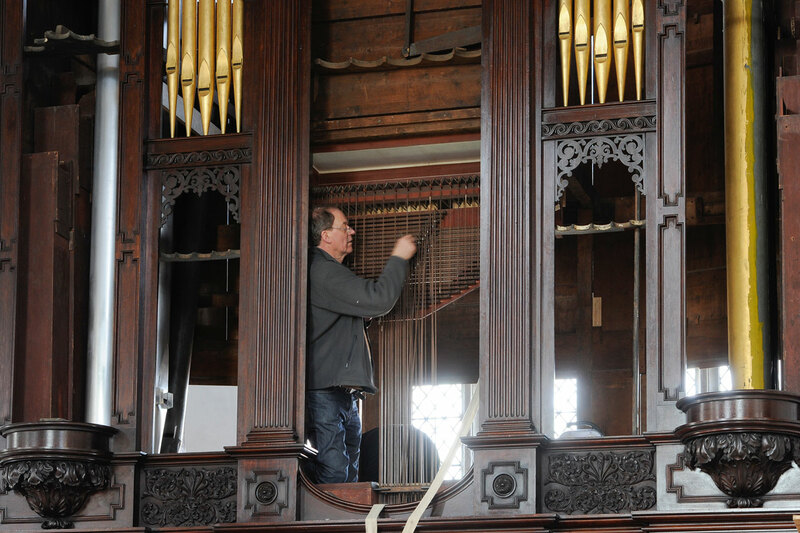 The Thaxted organ has in recent years benefited from occasional repairs and the attention of Peter Wood, organist to the church and local organ-builder, as it gently deteriorated and some of the larger pipes began to collapse. It has also benefited from becoming the second organ of the church, which removed some of the temptation to modernize it. But despite remaining usable, up to a point, it was obvious that the next restoration project would have to be a complete one. Dismantling the entire organ and removing it to the workshop is a major undertaking in itself. In the process, every step is photographed, parts are labelled when their function is not clear and notes are taken of the defects. The Thaxted pipes were packed into trays in their correct order, though when they were restored the original pipe makers’ marks were recorded to check that they were all in their original positions. The pipes were all measured for a restoration report, partly for research information, partly to show that the pipes have not been altered in the course of restoration. In the case of this unique survival, the volume of the pipes was recorded by Bernard Martin of Oxrecs recording company to make a comparison with the restored pipework. In the course of the examination a number of mixture pipes were found in the sesquialtera and cornet, and more were found in a box under the bellows, so that the Great mixture could be reconstructed. We were not so fortunate with the Great trumpet and bassoon, but could reconstruct them from the unaltered reeds in the Swell, applied to the scales of the surviving trumpet and bassoon stops from the 1829 J.C. Bishop organ at St James Bermondsey. The case may have been altered slightly over the years. The fretted pipe shades in the middle tower and lower flats look as if they were made later, perhaps by Holdich (who often used fretwork in his cases) in 1858; the mahogany of which they were made is of a lighter colour. The original shades may have had the crisp ornamental carving of the side towers and upper flats. The honeysuckle crowns over the side towers had been removed sometime after 1908 and placed round the feet of the pipes; they were returned to their original positions. To reduce dust levels in the organ and exclude the daylight shining through the front pipes and the carving a thin pine roof was made. At St John’s Chapel, Bedford Row the organ would have been directly under the ceiling, but at Thaxted it is in the open. The surface polish has been cleaned and revived, giving the organ an enhanced presence in the building. The leatherwork in an organ is crucial for its mechanism. It serves as a hinge in the bellows, and as a seal throughout the wind system. As a hinge, and as gussets at the corners of the bellows, especially in the feeder bellows which are connected to the pumping handle and are moved constantly, the leather has a limited life. 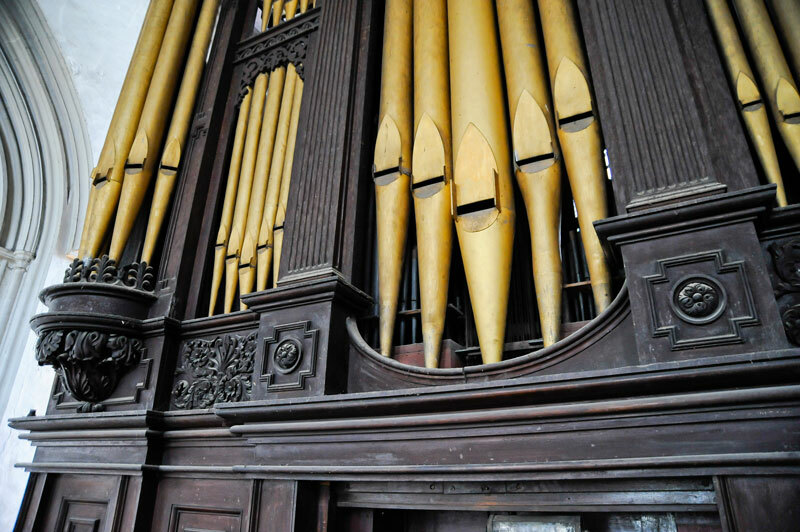 The leather in the Thaxted organ probably dates from 1858 when Holdich moved it, because he slightly altered the reservoir, which holds the wind from the feeder bellows under the correct pressure. (He inverted one of the two folds to keep the wind pressure constant as the reservoir empties.) Most of the rest of the leather was still Henry Lincoln’s, and although the leather’s life as a seal is longer than it is as a hinge, it still deteriorates and becomes less wind-tight, which is especially significant for the pallets (i.e., valves) which let the wind into the channels under the pipes (one for each key). All the leather has therefore been replaced with new, attached with animal glue in the traditional way. The keys are covered with ivory and ebony. The ivories had worn through in the middle of the Great and Choir keyboards. They needed to be replaced but presented a problem, because replacement ivory is difficult to find, and the Thaxted keys are very slightly wider than other organ keys, or to put it another way, the gaps between them are very narrow. So we have retained the ivory wherever we could and used replacement ivory where it was wide enough. The pivot points in the keys and at other places in the key and stop mechanisms had worn and become loose, and where appropriate the holes were made smaller or the pins larger. The Great stop jamb had been replaced with a new piece of mahogany, with round holes; it now matches the other stop jamb. 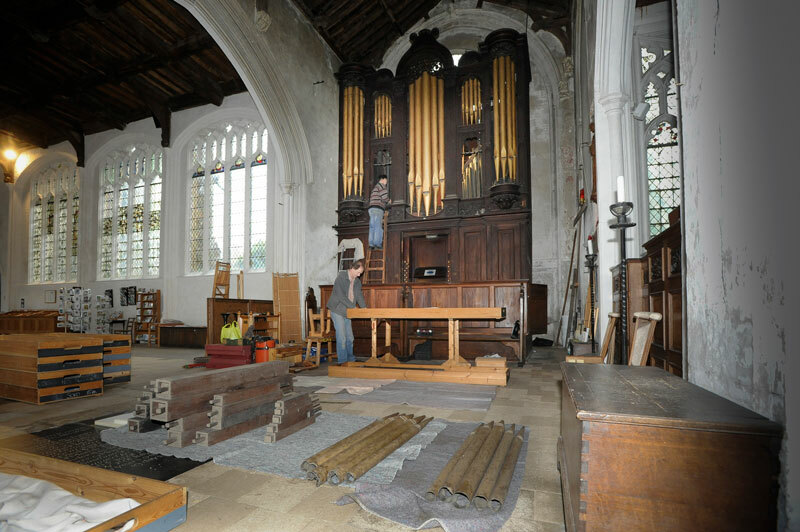 The restoration of the Thaxted Lincoln Organ would not have been possible without the generosity of so many people who kindly made donations and gave up their precious time to support fundraising events. We would like to express our heart felt thanks to our generous sponsors and everyone who helped in funding the restoration project without whom it would not have been possible. J,F.Knight, The Council For The Care of Churches Trust, Yardleys Charity,The Westminster Morris Men and many more. We would also like to thank everyone for their help with supplying copy and images for this website especially Nicholas Thistlethwaite, Dominic Gwynn (Goetze & Gwynn),Laura Kinnear (Holst Birthplace Museum), John Wellingham, Sybil King and everyone else who helped us, thank you so much. 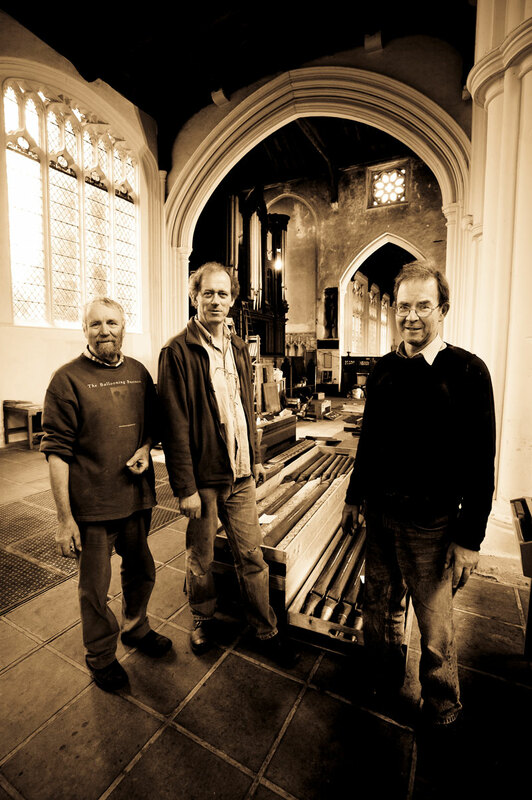 Also we would like to thank Nicholas Thistlethwaite and Goetze and Gwynn for their dedication, enthusiasm and expertise in helping restoring this rare and magnificent Lincoln Organ. © Copyright Thaxted Lincoln Organ. Registered Charity Number: 1127752. Website by Douglas.